I Thought My Job Was to Speak for My Child. Then I Heard This. I used to believe that my job was to speak for my child. I did not yet know that it was really to listen. To listen those who experience life through a lens more similar to hers than mine. To listen to those who know what it’s like to see what she sees, feel what she feels, know what she knows. When I listen, I hear the same refrain again and again. Don’t try to change me. Love me not by trying to wedge me into your vision of what it means to be human, but by respecting my experience of being human. Protect me by showing me how to love myself, believe in myself, value who I am as I am. Protect me by showing me that I am not alone — that there is a vibrant, diverse, beautiful community awaiting me with open arms — waiting to guide me, to support me, to welcome me home. Show me that you value my community. Show me that their opinions matter to you. Show me that you will never let your voice eclipse theirs … ours. Show me that you’re listening to them … us … me. That’s what I hear when I listen. So that is what I will do. 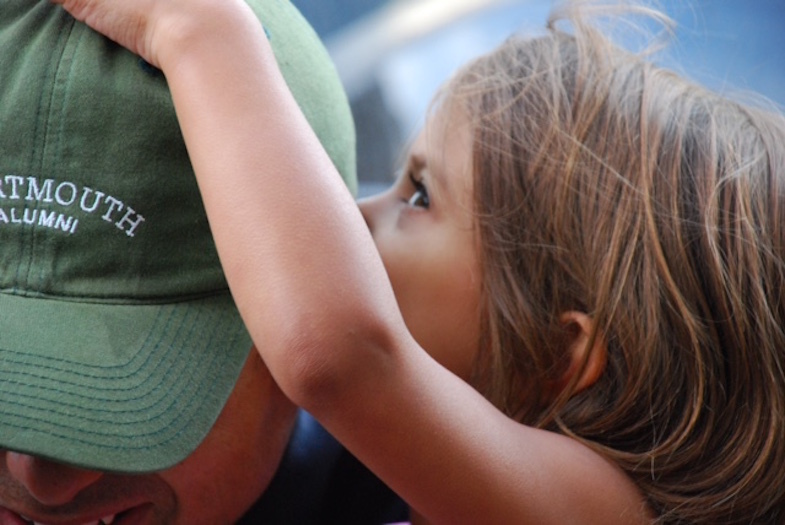 The image is a photo from 2008 of my daughter, Brooke, at age 5, whispering in her daddy’s ear. This post originally appeared on A Diary of a Mom. Do you have a story about your experience with disability or disease? Maybe a moment that made a big impact on you? Please send it to [email protected] and include a photo for the story, a photo of yourself and a 1-2 sentence bio. Check out our “Share Your Story” page for more about our submission guidelines. The Mighty finds strength, joy and beauty in people facing disease and disability. Like us on Facebook. Jess can typically be found at A Diary of a Mom, where she writes about her life with her husband, Luau, and their two beautiful daughters, Brooke, who is 12 and is autistic, generous, and funny as all get out, and Katie, who is 14 and is creative, excessively talented, and, while technically neurotypical has been diagnosed by her mother with a case of typical teenagerism and a heart the size of Montana. You can follow Jess on Twitter @diaryofamom, or join her on Diary of a Mom’s Facebook page, a vibrant and ever-expanding community of over 230,000 autistic people and those who love them.